The Red Lion Hotel01263 514964work01263 512834fax InnThe Red Lion lies in the beautiful North Norfolk coastal town of Cromer, overlooking sweeping beaches and Cromer's Famous Pier. Enjoy our fine wine selection and local real ales, whilst relaxing in our bar and lounge area that still showcases many original features. Our AA Gold Star dining offers superb Norfolk fayre where all our dishes are prepared fresh to order and complimented by home made breads, desserts and biscuits. Choose to stay in one of the 15 en-suite rooms each with its own style and personality many of which have sea views. 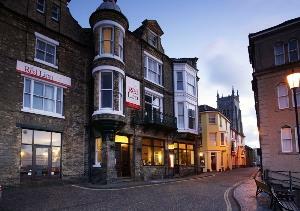 With a wealth of attractions in and around Cromer the Red Lion is a great base to explore from. We are pet friendly and also offer family rooms and free car parking. Minimum of two night stays at weekends (Friday/Saturday or Saturday/Sunday). Please call for one night stays. The Red Lion lies in the beautiful North Norfolk coastal town of Cromer, overlooking sweeping beaches and Cromer's Famous Pier. En-suite Rooms Local Real Ales and Wine Selection Craft Beers Refreshment facilities in Rooms Room Service Non Resident Breakfasts Function Room for Events Family Rooms Available Sunday Lunches Children welcome from any age. Take A148 from King's Lynn, A140 from Norwich or the A149 from Great Yarmouth. Once in Cromer follow the one way system through the town centre until you find the church on your left. Take the first turning on the left past the church and your will find our car park entrance on the right.